Growing squash, zucchini, watermelons, and pumpkins in your garden is incredibly fun. It's great to watch the gorgeous yellow blossoms turn into fruit and grow to fantastic sizes. But the vines do tend to take over your garden space often growing through fences you try to put up and dominating any other plants within their reach. There's a solution to this that is incredibly creative and adds a beautiful touch to your garden. Instead of letting these vining plants take over the ground, teach them to grow upwards and voila! All the sudden you have a stunning arch in your garden covered with gorgeous greenery. 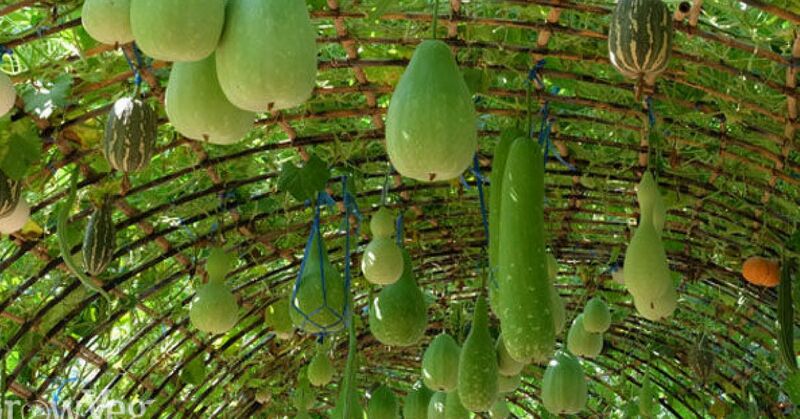 The first step to taking your garden plants vertically is to create an arch! You can either take the simple route and purchase one pre-made from a local garden center or you can build your own. Garden arches are commonly made from PVC pipe, or metal cattle fencing panels gently bent into an arch shape. Deep Roots at Home provides fantastic instructions on building your own strong, wind-proof trellis. After constructing the base structure of your arch, you will want to secure it in the ground to make sure it's stable. Depending on the type of material used to build to the base you can either push it 6-8" into the ground to secure it, or you can slide it over rebar that has been driven in the ground. 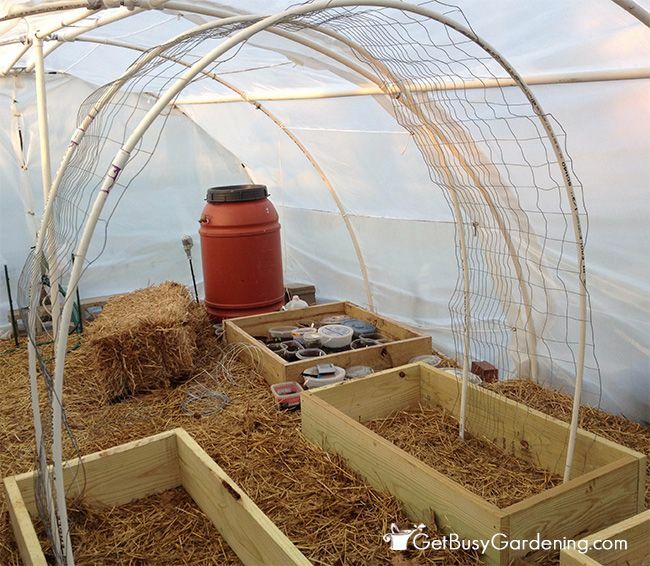 Having a stable structure will make sure it's impervious to wind throughout the growing season. 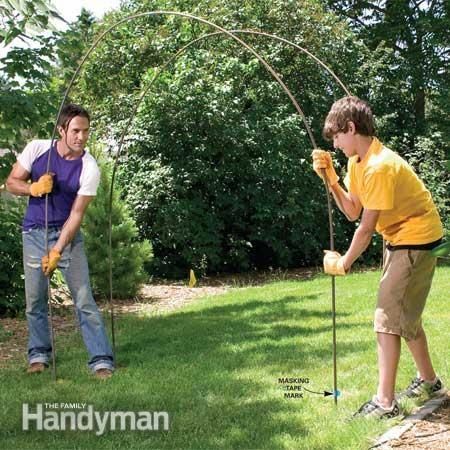 While your arch might have the basic structure to hold it upright, you'll want to add some extra "support" so your plants have more to grab onto as they grow upward. 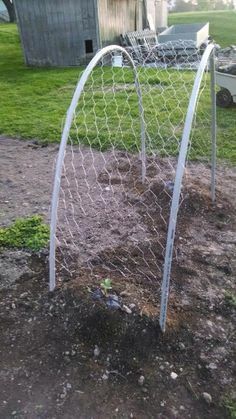 You can create a lattice design by tying twine between the supports to create a pattern, or you can secure something such as chicken wire, or the cattle fence panels to your PVC or metal posts. Once your arch is in place and has sufficient cross pieces to give the plants something to climb up, it's time to put your plants in the ground. Plant closely to the base of the arch, angling the stems slightly so they will grow towards the structure. 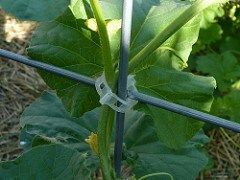 It may be necessary to help train the plants to grow upward by securing them to the arch with either twine or trellis clips. You can plant your plants slightly closer together when vertically gardening because they aren't competing for the same amount of ground space. Gardening Know How has a great chart on recommended plant spacing for common plants. After planting, make sure to cover the soil surrounding your plants with a good layer of mulch 2-3" deep to help decrease weed emergence, while keeping the soil moist. As your vines grow up and over the arch, fertilize periodically to promote the best possible growth. 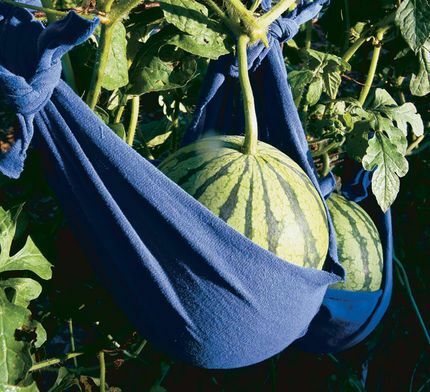 When fruits begin to form use old t-shirts, pantyhose, or netting to create slings that will support the weight of the fruit to prevent it from snapping the stems. Purchasing specialized gardening tools can add up to a small fortune -- but it doesn't have to!